Woot, Woot... it's been a fantastic break week. I think this might be our best homeschool schedule yet. We've tried matching Amber's old parochial school schedule (so that was silly, but we had just abruptly removed her 3 weeks into second semester of 4th grade). There was four day school weeks, which just cost us a day every week, but we still needed longer breaks throughout the year. Then we did six weeks on, one week off. That was mostly successful, however it seemed REALLY long between breaks. This year we are trying five weeks on, one week off. Last year the sixth week was always fairly low energy and seemed endless. I'm hoping to cut off the poor attitude and performance that last week with a slightly earlier break each session. However, it does mean that we can take fewer days off when it's not our break. We need to schedule as many doctors' appointments and special days during our break as possible. Even though we were on break, Amber had quite a few logged learning hours. I was able to convince her to complete a little German to stay ahead of my co-op class. However, I've determined it will really be doing those kids a disservice to go as fast as planned. I need to just bulk out the single set of books to qualify them for a full year credit of German because they are not going to be able to keep the planned pace with only an hour of class meeting time a week. (top-left) playing American Girl dolls while watching Netflix on her iPad. (top-right) Reading a new book Daddy bought her during a Dad / Amber trip to the bookstore. (bottom-left) A new light-up MLP watch. (bottom-right) It got down right cold here, but we still managed a trip to the Disney store. Amber loved her co-op classes last week and this week. She actually had homework in chess class. There's a couple of books for the class and assignments. I'm impressed with it so far and Amber adores it. The Teen Bible study that Amber started in co-op this week also has optional homework and tests for those wanting to turn it into high school credit (1/2 credit). Honestly, Amber doesn't need that yet, being in 7th grade, and has quite a bit of homework in confirmation already. Therein lies a point of contention between me and Amber. She doesn't really want to do the homework, but most of the other kids say they are going to do it. I told Amber she doesn't really have time because her confirmation and other studies take up quite a bit of her functional time. Amber is positive she can't participate correctly if she doesn't complete the extensive homework. Remember they are trying to beef up a one hour weekly (28 weeks) class to earn 1/2 credit = 65 hours. Aghhh! There are other confirmation students in the class too, so I'm curious to see if they actually do the work or not. The confirmation assignment this week is fairly extensive too. They are quizzed at the beginning of each class over the previous assignment. Failed quizzes must be retaken privately until they are passed. I'd rather Amber devote her time to confirmation homework than the co-op Teen Bible study optional homework. Amber also, finally, learned how to cross stitch this week. 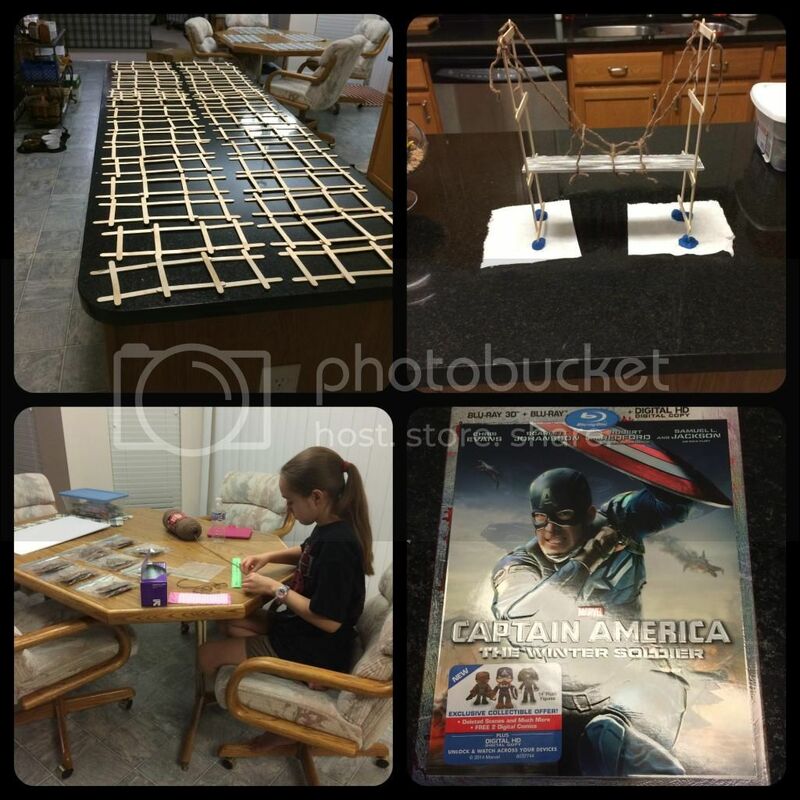 I had taught her a while back, but she didn't take to it and really didn't enjoy it or even finish her basic project. This week she tried a beginner's kit and loved it. Whew. I adore cross stitch and so hoped Amber would some day change her mind. 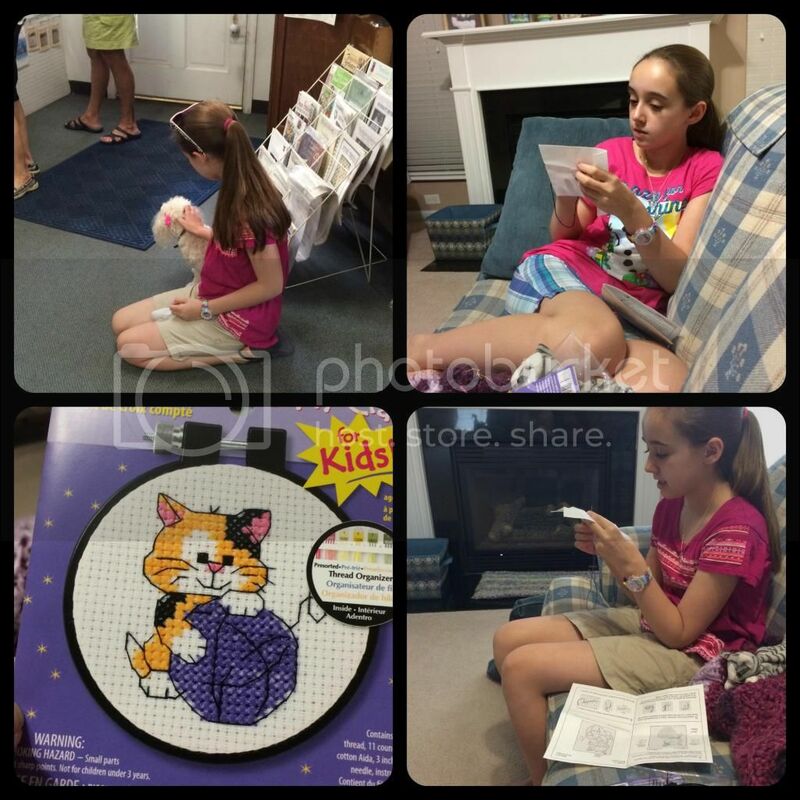 She spent many hours this week resting, watching movies, and cross stitching on her project. Working on her cross stitch project and (top-left) a visit to the cross stitch store in the historic district. Amber loves the store, even if it is just to pet the owner's two doggies. Amber loves animals and they love her. Amber had a great visit with the dietician this week. We don't go back for three months!!! Amber has grown another quarter of an inch and gained 1.5 pounds. Even though Amber's diet is still so limited, the dietician is pleased with the variety of dishes we are able to give her using those few ingredients and the way we give her as many nutrients as possible from foods instead of vitamins (which she does take too). The dietician said that even though Amber's diet is strictly limited she eats healthier than the majority of people because there is almost no processed food in Amber's diet. The dietician even asked for some of my recipes (which are simply altered recipes written by other people). Still, she wants to be able to provide them to other parents of children like Amber because many people have trouble finding foods their children tolerate. We had a field trip planned to the St. Louis Art Museum with my mom this week, but that morning Amber work up feeling off and her vitals were not ... good. Amber was hopelessly disappointed, but I postponed the field trip. Amber tries so hard to handle everything, so when she voices a sadness or disappointment we know it was quite upsetting for her. The Art Museum trip was such a situation. Because Amber was so upset, we decided to still meet my mom for lunch and try a couple of stores in the local historic district that Amber likes. It was a rough day, but easier than the museum and Amber had a nice time. We have numerous outings and field trips on the schedule with our homeschool group over the next few months too. I normally would not like to be away from home that much, but Amber desperately needs to feel included right now. Her condition is making her feel isolated even when she is with a group. I've signed us for events that I think she can handle and aren't scheduled on busy days for Amber. 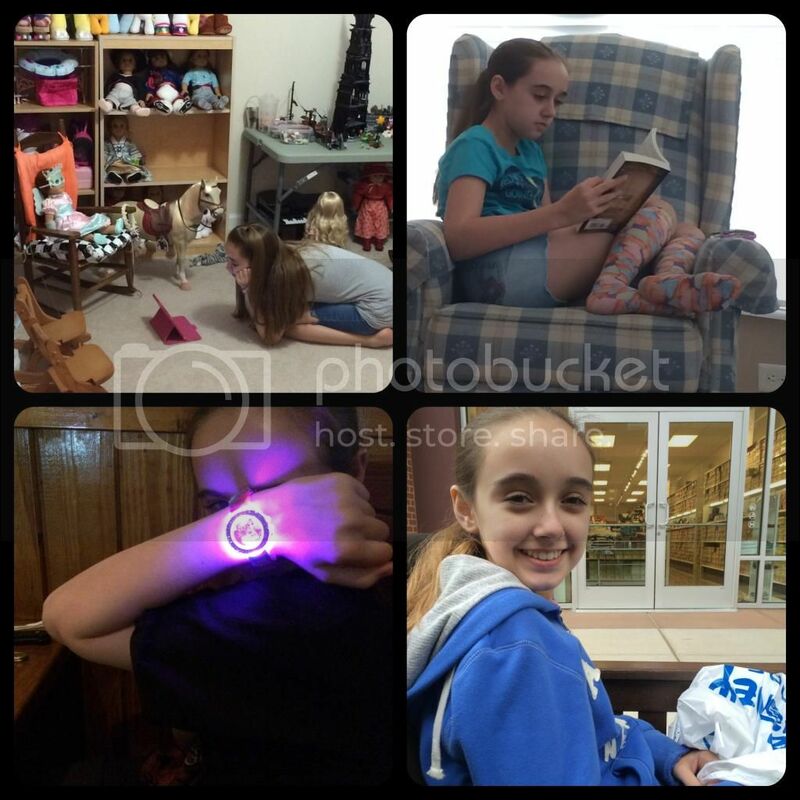 The homeschool group has really grown since it started last summer and is an extremely active group for all ages. There are activities, field trips, get togethers, and co-op classes for pretty much every age and interest. We are so fortunate to have this great group. Next week Amber has her tilt table test and we expect that to be a fairly awful day. The nature of the test is such that she will be ill during the test and for some time afterwards. It also falls on confirmation day, so I just hope Amber is recovered prior to the evening otherwise she will be scheduling a private makeup class. (top-left) Bridge struts for my 50 States class' project. (top-right) The suspension bridge project for class. (Bottom-left) Amber working on yarn packets for each child in my class. She is such a huge help. She actually made most of my sample bridge and a good deal of the bridge struts. (Bottom-Right) Amazon came through again; it arrived on release day and we promptly watched it, again. I've been extremely proud of Amber this week in how she has started to listen to her body over her desires. It's terribly difficult to be an exuberant 12 1/2 year old girl, yet be so limited in life. I am thankful for all of Amber's understanding and supportive friends, especially this week. So hard to see our kids struggle. You're doing a good job ! Awesome for finding a schedule that works! After 10 years of home learning, I still haven't found THE schedule for us, but I have hope! LOL I love cross-stitch too, but haven't done it in a long, long time. I started knitting...What a cute project with the kitty & yarn! Oh, on the pulse! She's a trooper! Oh he pulse... And the very low blood pressure. Thursday probably scared me me the most though. Pulse was high (150's) PB was bp was low, but for 4 readings in a row the monitor tagged an irregular heart beat. I almost didn't take Amber to co-op, but finally after a half hour rest Amber had a normal heart beat. Sigh. I am so glad the schedule is working. It is our favorite schedule too. How wonderful that Amber has understanding friends. I just went and looked up the tilt table test. That is not going to be fun but I guess it is necessary. 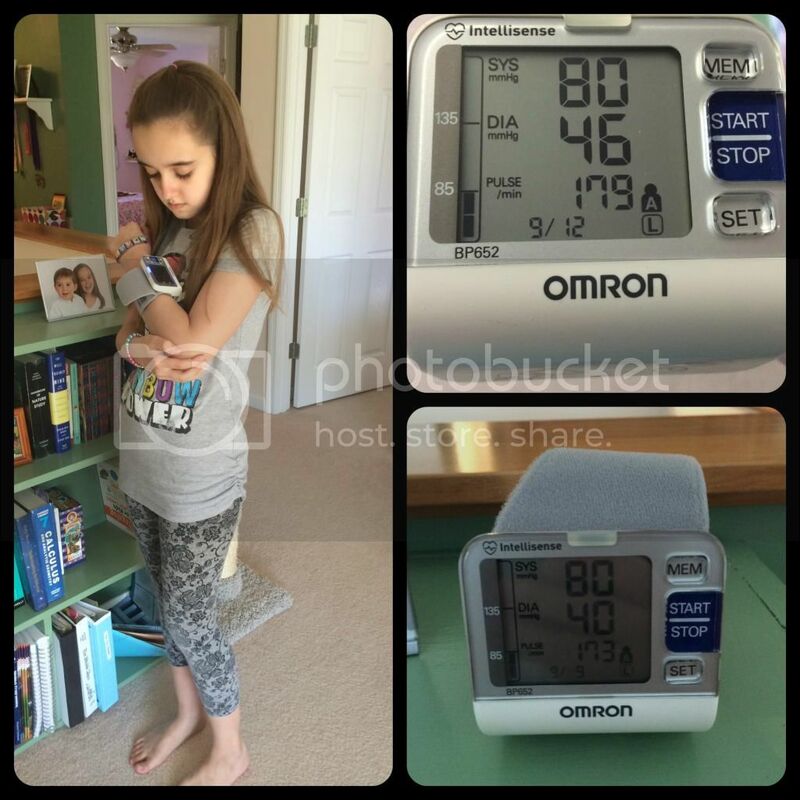 I am glad to see that Amber is gaining weight. We think that Philip is as well but we only see the endocrinologist once a year. I can't wait to get Captain America Winter Soldier but I have to be patient. I don't have time to watching right now any ways. I'm glad the schedule is working too and that you all had a great BREAK!! I think your bridge struts project looks amazing. I'm glad Amber is a help to you. I know how that is, I couldn't get by some days with Kei helping me. Happy weekend to you and your family Christy. I'm so glad you have found a schedule that works for you and helps you make the most of Amber's energy. She seems such a lovely, peaceful girl. Sounds like you are getting good at balancing schedules and how much activity Amber can handle. It's great that she is handling her limitations so well. That has got to be very hard for her. I will need to look up the tilt table test too. I hope and pray that all goes well and she'll be right as rain for Confirmation class! I love the picture of her playing with her dolls, that looks so familiar to me!